Fine in the level of skill is the work of Paul Gauguin’s “Portrait of Madame Gauguin in an Evening Dress”, created by him in 1884. The portrait is painted in the technique of oil painting and is currently kept in the National Gallery in Oslo. The color range of the canvas is characterized by softness and a subtle selection of shades. The canvas is unusual and in composition. The figure of Madame Gauguin is framed by a dark, saturated graphite background. Madame Gauguin is depicted in profile, which gives her an image of sublimity and elusiveness. The portrait seems unattainable, since the most important thing is hidden from us: look, facial expression, lip line. Nevertheless, the portrait is full and significant. It is significant and important already by the fact that it lacks detail and utmost proneness. Beautiful milky shades of the top of the evening dress harmonize with the marbled tone of Madame Gauguin’s skin. The resulting image is elegant and captivating. Creating a portrait, Gauguin used “timid”, slightly muted, pastel colors. The portrait turned aristocraticly restrained. A dark cold background with shades of blue gives the portrait an even greater detachment and severity. The background from the point of view of the color decision resembles the quaint coloring of some gem stone. A complex intertwining of shades sculpts the volume and structure of the entire canvas, giving it an original texture and spatial clarity. The image of Madame Gauguin came out alive, sensual. The image is more like a painting sketch or sketch, but nevertheless, it is enough to feel the proximity, the presence of Madame Gauguin, her breath and warmth. The artist was able to convey not just an external form, a portrait resemblance, much needed, but not always sufficient. Gauguin, with the help of a brush and paints, transmitted the full bright emotional state, the atmosphere of the evening. Only considering the canvas as a single work, without dividing it into plans, structural components, aesthetic and non-aesthetic overtones, and even without analyzing artistic and visual means; only in this single case will we be a little closer to understanding the genius, rather than exposing and exposing all his artistic secrets, to understand which to the end is hardly possible. For this you need to be not just a creator, for this you have to stand on one level with a genius. 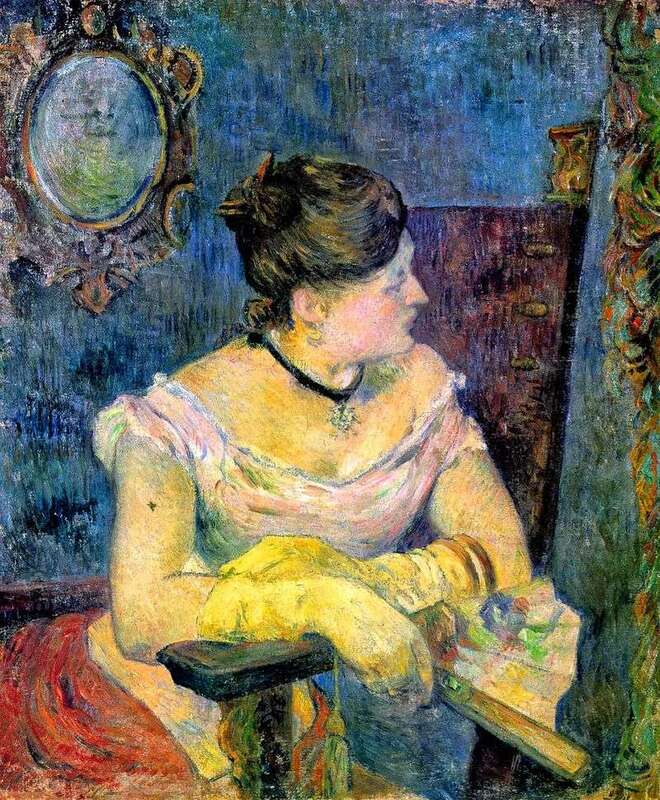 Description and meaning of the painting Portrait of Madame Gauguin in an Evening Dress by Paul Gauguin.